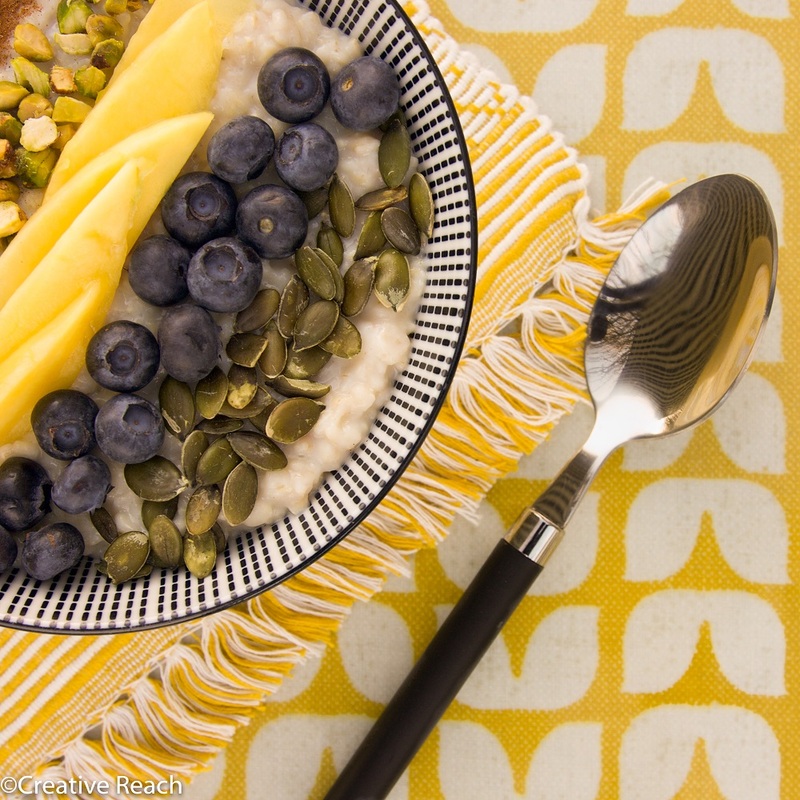 Check out this bright and cheerful bowl of healthy porridge on our Ochre Tulip oilcloth tablecloth. It’s bound to put a smile on your face first thing in the morning and bring a bit of sunshine to your day. A bowl of comforting, creamy porridge made with oats is high in nutrients with many potential health benefits and may even help you live longer! The type of oats you choose to use is completely up to you. Jumbo oats will produce a really chunky porridge, whereas porridge oats will give you a smoother, creamier texture. Although porridge can be made with just water, regular milk will produce a creamier consistency. We recommend trying coconut milk, which will turn an everyday bowl of porridge into something a little more luxurious. Here we have created a delicious combination of toppings consisting of pumpkin seeds, pistachios, blueberries, fresh mango and a sprinkling of cinnamon. A drizzle of honey would give you that little bit of extra sweetness if you have a sweet tooth. We like to change the toppings each morning using a selection of fruit, seeds and nuts. You can try any combination of fruit, but have you tried pomegranate seeds, figs, dates, bananas or blackberries? You could even match your toppings with the colours in your tablecloth as we have done here. Nuts and seeds can be purchased separately but we have found some great mixes sold in health food stores and supermarkets. Let us know your favourite combination.